(Nanowerk News) In atomic physics, Hund's rules refers to a set of guidelines which are used to determine the term symbol that corresponds to the ground state of a multi-electron atom. 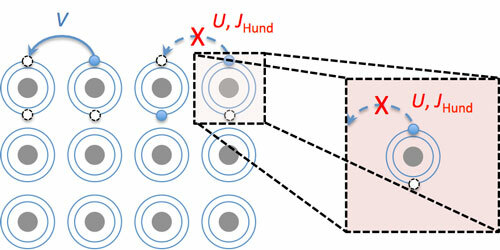 The concept of a ‘Hund’s metal’ has arisen from the realization that the interactions that drive Hund's rules for filling the orbitals of isolated atoms with electrons can also dramatically affect the hopping of electrons between atoms in solids, the motion of which is correlated and may support both high-temperature superconductivity and magnetism. Electrons in a solid can hop from atom to atom at a rate V. This can be suppressed by Coulomb interactions U and Hund’s exchange coupling J - the same interactions that give rise to Hund’s rules - leading to Mott Insulator and Hund’s Metal behaviour. In their recent work, Khajetoorians et al. examined how the basic building block of a Hund’s Metal, a “Hund’s Impurity”, can be constructed at the single atom level. LCN researcher Dr. Cyrus Hirjibehedin has written a News & Views article in Nature Nanotechnology ("Magnetic atoms: The makings of a Hund's metal") providing an overview of this realization of the atomic-scale building block of a Hund's metal. This follows a publication by Alexander Khajetoorians and colleagues in the same issue that reports that a single iron atom on a platinum surface forms the basic building block of a 'Hund's impurity'.